Don’t work to fit your bed. Make your bed work to fit you. That is Luft’s motto and the reason the company offers several different custom comfort options to suit the needs of any sleep preference. With 60 years in the mattress industry, this company has dedicated themselves to creating high-quality products for an affordable price. 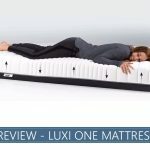 Our in-depth overview of the Luft will look at the Luxury Firm Multi Sleeper, with references to the Plush Multi Sleeper and Firm Sleeper as relevant. We’ll break down the construction of this item and provide you with an overview of how it performs in important sleep areas. Check out our full analysis of this product below. Or skip to the end of this review for our overall impressions of this bed and our final scores based on comfort, edge support, cooling, and more. Are looking for personalized pressure relief – With 7 comfort zones, this product is designed to provide Firmer or Softer feels as needed for heavier or lighter areas of the body. This should provide the right amount of pressure relief and support for all sleep positions. Sleep hot – Graphite, cooling gels, and an individually pocketed coil system team up to fight the heat and should provide you with a bed with cool sleep experience. Want enhanced edge support – This mattress features a Quantum Coil design that should reinforce the edges of the bed, making your sleep surface feel just a little bit bigger. Less Soft foam options should only help to create an even more stable edge. Need enhanced motion control – Because this item has more bounce than a denser memory foam construction, couples may notice slightly more motion transfer than some all-foam beds can deliver. However, most shoppers are not likely to consider this a dealbreaker when choosing a mattress, and bounce can help with repositioning. If you want to see something else, you can visit our full list of top picks for 2019 here. This product is a foam and individually pocketed coil hybrid, bed-in-a-box product. This mattress is best used on a flat, supportive surface such as foundations, box springs, and platform frames. The company recommends slatted frames have slats no more than 4 inches apart. The cover is made of a stretchy fabric that should remain breathable and aid in easy repositioning. The following breakdown of materials refers to the Luxury Firm Multi-Sleeper model. The top layer contains 1 inch of Graphene Infused Premium Memory Foam. This material should help to conduct heat away from the body, helping to promote a cooler sleep experience. The middle layer consists of 2 inches of High-Density Adaptive Foam. This layer should provide contouring and pressure relief for a comfortable sleep. The bottom layer is made up of 1,074 individually wrapped Quantum Coils. This layer has 7 zones to provide personalized support in different areas of the body. Note: The company does not provide full specifications on their website. We scored the Luxury Firm at a 6-7.5 on our scale of 1-10 which sees 1 as marshmallow Soft and 10 is hard as cement. This puts this comfort level at a Medium to Medium-Firm. We ranked the Plush bed as a 3.5 and the Firm option at a 9. Learn more in our firmness scale guide and learn about comfort levels. The cover should feel Soft and cool, wicking moisture and preventing overheating. The gels inside the comfort materials and the coil system should help keep air circulating to further move heat away from the body. Most buyers should find this item sleeps quite cool. The Luxury option should provide a minimal cradle with a body-contouring effect. Those who like a deeper hug may opt for the Plush and those who prefer to float on top may prefer the softer versions. Pressure relief should be adequate for most people, but those who want enhanced pressure relief may want to opt for the Plush bed. You should notice significant bounce due to the pocketed coils beneath the foams. The foams should be slower to respond than latex, but faster than memory foam. This should all add up to easy repositioning for combination sleepers. Back sleepers should be able to find a comfort level that best suits their individual needs thanks to the Plush, Luxury Firm, and Firm options available. Most may prefer the latter two options, as these should provide more adequate lumbar support and promote good spinal alignment. Stomach sleepers usually prefer a more solid feel and may want to check out the Luxury and Firm versions of this product, depending on their weight or preference. Either of these products should prevent the hips from sinking too deeply and should promote a neutral and straight spine. Most side sleepers should find the Luxury Firm or Plush options suit their needs, though some may experience pressure in the hips when lying on the Luxury Firm bed. Those who do need a softer experience should opt for the Plush version. The Luft bed has a variety of options that should meet any shopper’s needs based on their individual preferences. The zoned layer is likely to provide ample support and pressure relief to sleepers of all preferences, helping to promote a neutral spine and eliminate aches and pains from too much sinkage or pushback. Those with different weight or pressure relief concerns should find a suitable option in one of this company’s three different comfort levels. 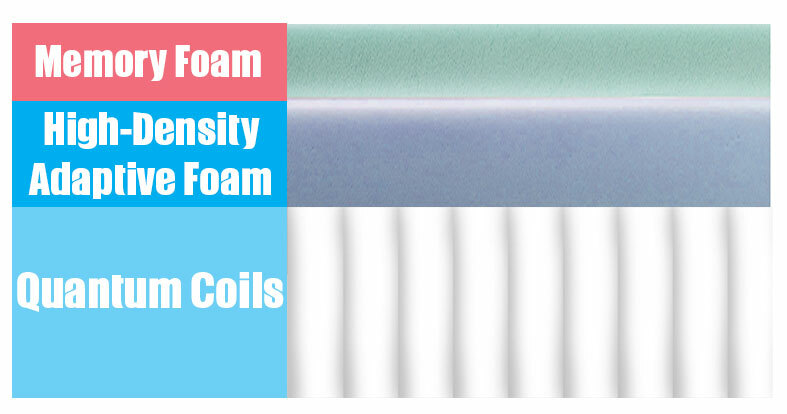 Foam products should dampen most vibrations, while innerspring items may allow more movement because the springs are connected, causing energy to move throughout the entire bed. The coils in this brand are individually pocketed to help prevent movement from affecting the other coils. As this is a hybrid system, the individually wrapped coils and foam layers should combine to dampen movement and minimize most sleep disruptions. You should notice higher than average edge support from this mattress due to the Quantum Edge design that puts a row of thin but solid coils right around the edge. There may be compression through the comfort foams, but the coils should help provide stability when sitting or lying at the edge. This should help make the bed feel a little larger, which should be beneficial to co-sleepers and sprawlers. Multiple Firmness Options – The Luft Bed comes in Plush, Luxury Firm, and Firm comfort levels. Trial Period – Luft offers a 100-day trial period for this bed. Warranty – This item comes with a 10-year warranty. Shipping – This ships for free in the United States. CertiPUR-US® Certified – The foams used in this product are safety-tested and certified to be safe for public use and have low or non-existant levels of harmful chemicals like formaldehyde. Charitable Donations – Luft will work to donate returned mattresses. Any preference should be met through the various comfort options provided by Luft. Enhanced edge support and good motion control should be present, making this a great option for co-sleepers. Plush, Luxury Firm, and Firm options are all available to provide various levels of sinkage, contouring, and pressure relief. Low motion transfer and enhanced edge support should make this a desirable option for co-sleepers. Luft’s motto is: Life isn’t one size fits all. That’s why the company offers multiple comfort options to ensure that you find a bed that fits you. This lends a lot of value to an affordable product that uses high-quality materials to provide a luxurious feel for people of all preferences. I let my husband determine the mattress to buy for us since he was in the Minneapolis area on business. He picked the Luft Luxury Firm. He claims to like a firm mattress & I have issues with pressure points. It sounded as though it would be a good compromise. I think this mattress firmness is not good for people over 200 lbs. I wake up nightly with pressure point (Hips & Shoulders) & back issues. We are trying to give it a go & allow for a break-in period but it is really not allowing me to sleep. I think my husband isn’t even comfortable but doesn’t want to admit it. It might be ok for back sleepers that are over 200 lbs but for a side sleeper I would opt for the Soft version. It doesn’t seem to retain heat but I wouldn’t consider it cooling. There is a little noticeable motion transfer. Also, there seems to be some areas of the mattress that are poofier than others. I think think this is due to it being bound up in shipping so am hoping it settles down.